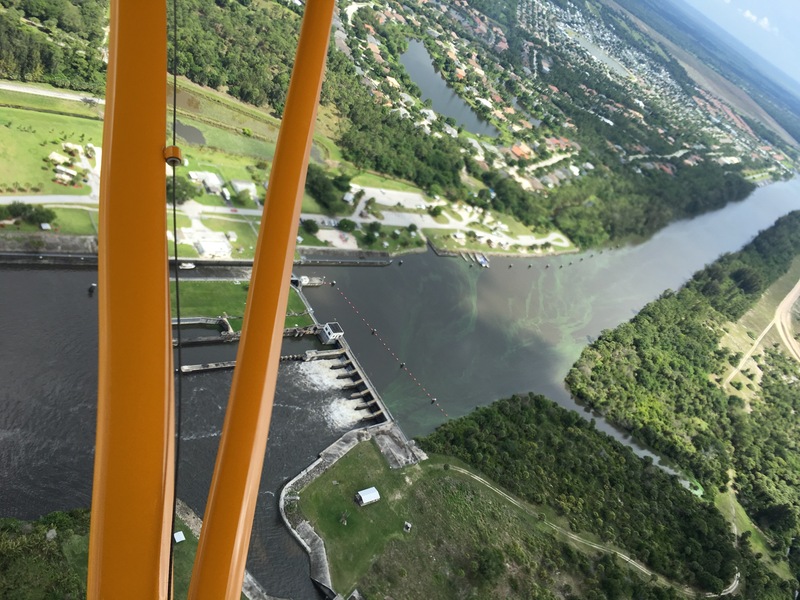 Aerial of S-80 at St Lucie Locks and Dam. 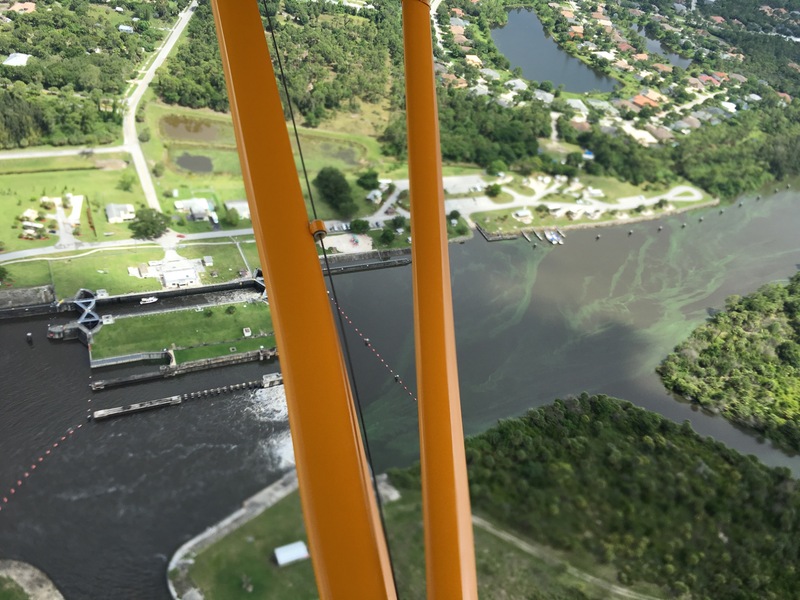 Visible cyanobacteria bloom flowing through S-80 from western area of C-44 towards the St Lucie River. These blooms were documented in Lake Okeechobee and around S-308 weeks ago and are now being released into our now fresh river. Photo Ed Lippisch. At that time there was a question for me; now there is not. 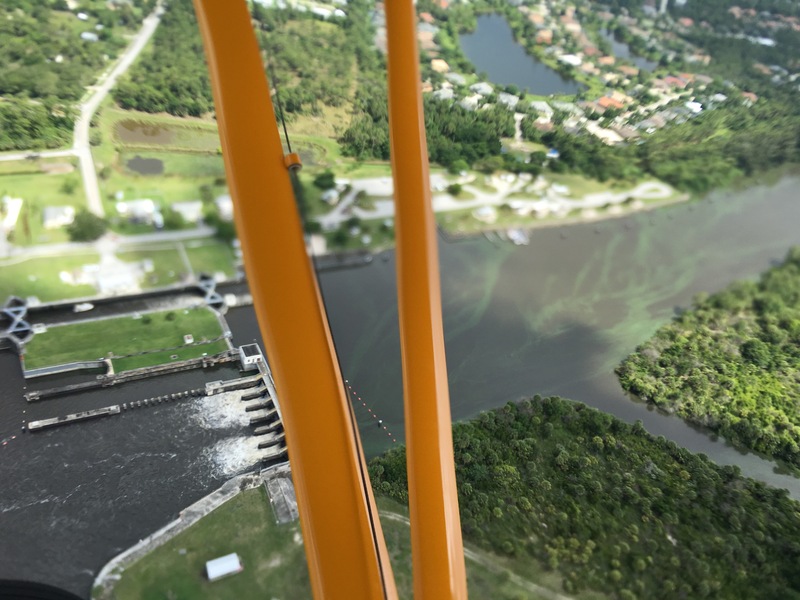 The 2014 post told the story of seeing cyanobacteria’s fluorescent blooms in the lake when my husband Ed and traveled through the St Lucie River to Lake Okeechobee by boat passing the St Lucie Locks and Dam (S-80) and Port Mayaca, (S-308) in 2009. This was just when I was beginning to focus my interests on the health of the St Lucie River/Indian River Lagoon as I had been elected to office in the Town of Sewall’s Point in 2008. During this trip it hit me that the algae started in the lake. 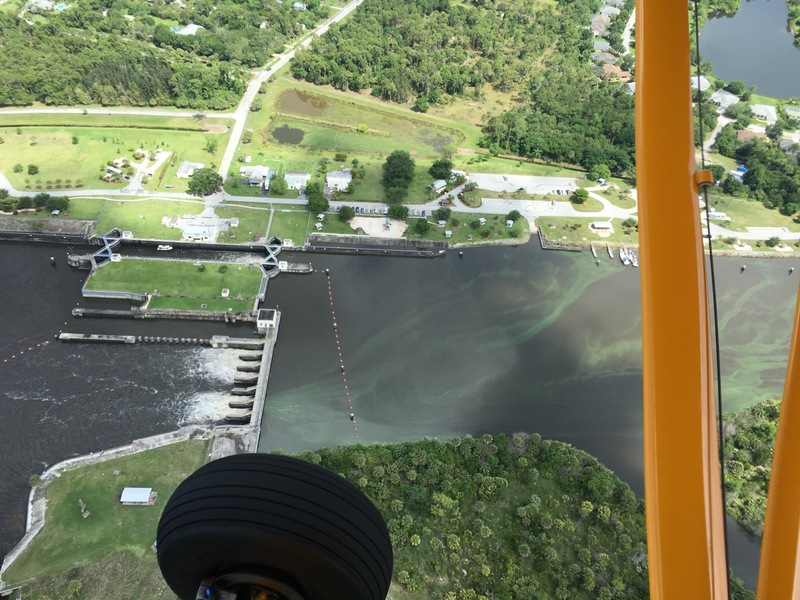 Ed and I had traveled throughout the St Lucie River and C-44 canal, and when we got to Port Mayaca, at the lake, there it was….the fluorescent green algae. Not being a scientist or biologist –it finally hit me “this is a fresh water bloom.” It blooms in the lake….not in the river that is more saline. But once the river is fresh from releases from the lake and canals, it can spread there too. 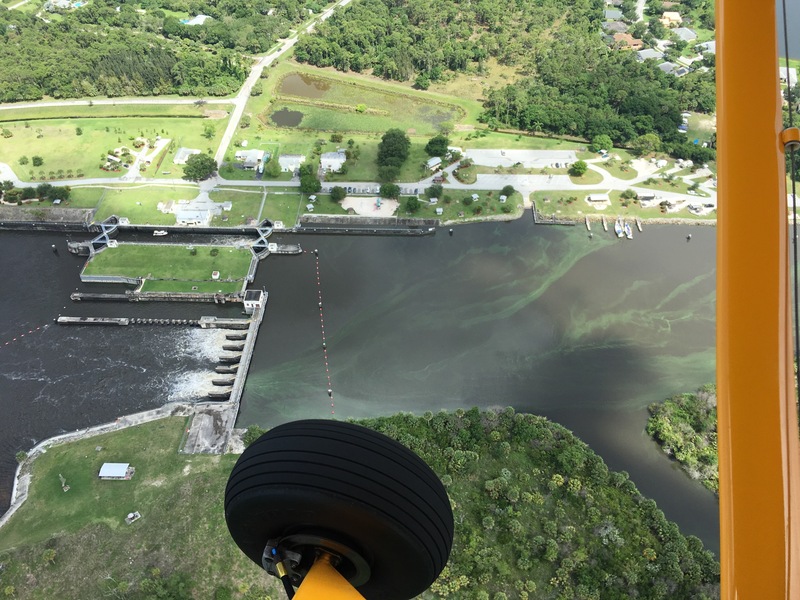 The story of the blog continues into 2013, when I saw the SFWMD testing the water at S-80, St Lucie Locks and Dam, and to my surprise I could see the unmistakable flourescent green cyanobacteria that often becomes “toxic”going right though the gates! I found this unsettling. Obviously the SFWMD, the ACOE, DEP, the Florida Health Dept and other official entities were in full knowledge that these dangerous blooms were being sent down the river to the residents of Stuart, Florida. Here I was an elected official representing a peninsular community and I had no clue. I had never even heard of this. Something is weird here, I thought. There is no warning to local governments. There is no press for the public. This is just everyday business….the everyday business of quietly poisoning Martin County’s citizens. How could this be? I wondered…Maybe I am missing something? Maybe I am exaggerating? Over time, I wrote other posts about this too. I decided that this concept could be widely shared and understood, but we needed a good visual. Thank you to my husband, Dr Ed Lippisch for these photos and two short videos taken on Memorial Day, May 30, 2016 of tremendous blooms knowingly being sent through the open gates at S-80 towards the St Lucie River. We don’t have to wonder anymore. In broad daylight, for all to see. State and Federal agencies….you’re busted. *Thank you to the Stuart News, the River Warriors, Bullsugar.org and other river advocates for all of their work identifying and reporting the blooms especially in the lake and around Lake O this 2016. You are amazing. ThAnk you and your husband for being so diligent. You are amazing. I have been following your blog for a while. It needs wider viewership I live in Palm Bay (relatively new to the Space Coast) and I am learning about the water problems on this coast. I come from Sarasota-Bradenton and have lived in Gainesville, as well as, Dade & Broward many years ago. When the Banana River collapsed recently, many people took notice of the terrible problems that just came to head with the collapse and massive fish and marine life kill. I heard Maggie Hurchalla at the FIT event here in Melbourne in April attended by 450-500 people. It was an education for me to learn about a problem that has been percolating for a long time. I am obviously still learning. Thank you for all your time and effort, and your husband, as well. I will continue to follow your blog. What can a citizen like me do to help? Thank you. To help just keep sharing and connecting with others. Make change a person at a time. Excellent work – I’m going to start calling you guys “Woodward and Bernstein” ;-). We just need National attention – ie. 60 Minutes. Why not send them this story? It’s the only way we’re going to bring this criminal act to the forefront. I am certain someday this will happen. The problem is getting worse and it’s too obvious to just be ignored forever. Will try to do! Thx Ezra! The link for 60 Minutes is for Australia! Jacqui, you should consider getting a weekly column on the Opinion page in the Stuart News. We need more than just your Blog subscribers to be aware of this very serious problem. The more exposure, the more of a possibility something would get done. Jacqui…Since 1966 I fished the SLR side of Sewell’s Point, and captured many prize snook. As I look back, the poison algae was being released then. We assumed it was just business and usual, and nothing could harm this wonderful sportsman paradise. But our planet has grown smaller, climate change is happening, and algae blooms are now verboten. The estuary can only take so many years of sludge and muck and algae….and now we have a problem the governor or our elected officials will not act on. Go forward and bring change Jacqui. Your support will grow. Keep punching out the blogs on this topic. Water is man’s last great resource. Thank you so much for the inspiration to keep pressing forward. Thank you so much for the message. Jacqui and her husband are whistleblowers sounding the alarm. I hope more and more Floridians are hearing their warnings. Our water is in deep trouble. Thank you for this video! Stops the talk that Martin Co is to blame for this. Is there anyway we can get video north of Lake O? Rubio is stating the 90% of the water is coming from Kissimmee/Orlando. Is the water flowing south green with algae, too? I read that Kissimmee has filters and they restored their riverbeds over the last decade. So if that is true, are the pollutants along the river/canal between Kissimmee and Lake O? If so, can we get a visual of it to correct this problem at the source whether is agriculture or paper mills, etc? Thank you!